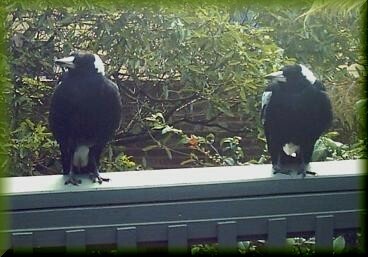 Link to a very short video of our Magpies' Songs. Below are a couple more photo's of Bungwing you might like. More information and stories on Bungwing a little further down on the page. This is Bungwing on the right and his wife. Unfortunately Bung is no longer with us, due most likely I would think, to natural attrition. He was there as usual and one day, simply did not return. I called and called for days, but he was nowhere to be seen. We have not seen him since. A new very much younger male bird is in attendance on the remaining females, who are also in their 20's. I am not too familiar with the habits of birds, but I suspect that Bungwing either moved aside to allow a younger male to take his place, or he simply came to the end of his natural life. I so miss the dear old chap - he was such a treasure, and for such a long time. I have to tell the story of one particular day of 114°F I thought I'd seen the last of dear old Bung. This was a few years back. I had been out in my car and arrived home to see 'a magpie' up against a neighbours fence with his wings spread right out, his head turned upward with neck arched backwards. I was mortified and rushed over to him - I knew it was Bungwing. And I thought he was gone - in the heat. As I approached, he moved - then he assumed an upright position, ruffled his feathers and waddled off under a tree ! I went after him, still thinking the worst, wanting him to fly a few paces. Well of course he wouldn't - and I am rummaging around under neighbour's bushes - flapping my arms (in the heat - whew) ... forgetting that Bung would never fly away from me. I should've realised that. Had a brilliant idea. Went and got some meat from the refridgerator and whistled. Oh he could fly alright. Landed within a second on the balcony and received his treat. Apparently he was 'sunning' himself ! IN THAT HEAT ? I later on saw several other birds doing the same thing. Perhaps it is in fact a way that they keep cool on a hot day - who knows - you would think they'd at least try to keep cool in the shade !!!!!!!! That was one big fright over and done with. 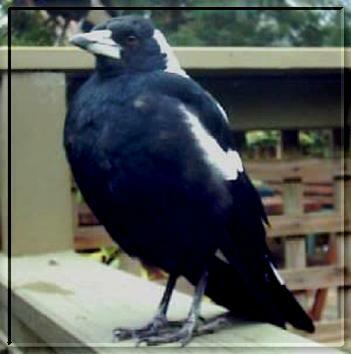 We have many native Australian birds living, nesting and feeding in our garden. Above was my precious Bungwing, so named as he had a mis-shapen right wing which hung down noticeably. This didn't affect his ability to fly at all. He became tame when very young, and I whistled for him to come and get some mince beef tucker, or sweet biscuits. 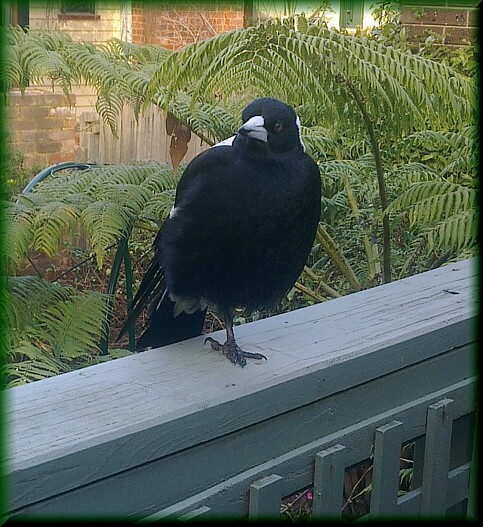 He would swoop down and sit on the patio railing, taking the food from my fingers - ever so gently. He was usually accompanied by his wife. He was always in the garden to greet me when I come home from shopping - softly warbling his greeting and waddling over to the car to stick his beak into the bags of shopping I had. It was priceless - - and very precious. Farewell my fine feathered friend.